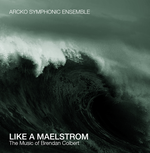 Like a maelstrom : the music of Brendan Colbert / Arcko Symphonic Ensemble. Like a maelstrom : for piano, trumpet in C and chamber orchestra / Brendan Colbert. ...like a Maelstrom (double concerto for piano, trumpet, and small orchestra) takes its title from the opening lines of a poem by Emily Dickinson, and is - as the title suggests - energetic and turbulent, providing a thorough workout for both soloists. It was premiered in 2015 by Arcko Symphonic Ensemble under Timothy Phillips, featuring Peter Dumsday and Bruno Siketa. It is a work that is especially challenging for the soloists, presenting difficulties that both Peter and Bruno confronted and mastered with astonishing stamina and skill. Instrumentation: Piano, trumpet in C, percussion (2 players), strings (min. 4-4-2-2-2 but 6-6-4-3-2 or more preferred). Contents note: In one continuous movement. 19 Mar 2016: at Melbourne Made (Church of All Nations). Featuring Timothy Phillips, Bruno Siketa, Peter Dumsday, Arcko Symphonic Ensemble. 21 Feb 2015: at Arcko Symphonic (Church of All Nations). Featuring Arcko Symphonic Ensemble, Bruno Siketa, Peter Dumsday, Timothy Phillips.